Legendary American filmmaker Nicholas Ray (perhaps best known for Rebel Without a Cause) was born August 7th, 1911. In honor of Ray's 100th birthday this month, several exciting projects are in the works, including the Centenary Project and an upcoming film premiere at the Venice Film Festival. Here to tell us a little bit about what's planned is Susan Ray, Nick's fourth wife and widow, who has generously agreed to be interviewed for a Q&A. Read on as she discusses Ray's life work and reveals some exciting information about an upcoming film based on her memoir I WAS INTERRUPTED. 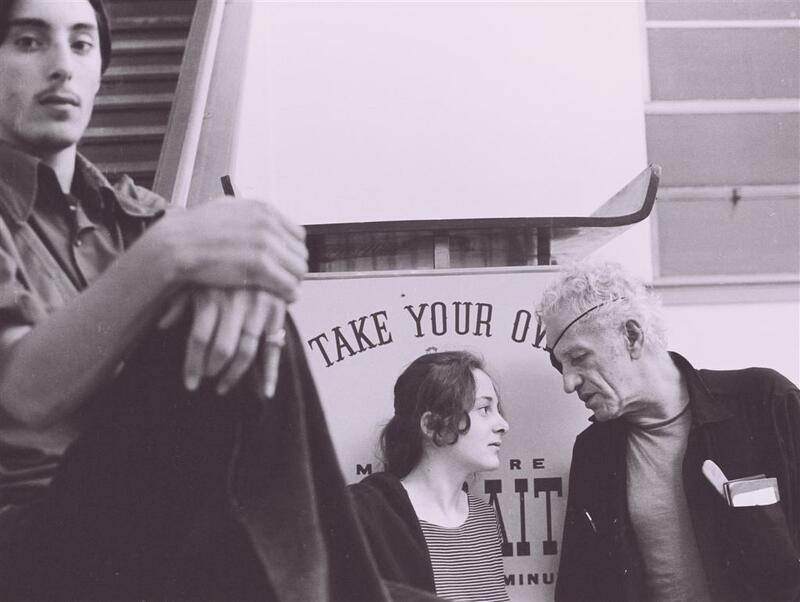 Susan and Nicholas Ray at the Greyhound Bus Terminal, Binghamton, NY (circa 1971). Photo from Mark Goldstein/IRC's SUNY Binghamton 1971-72 collection on Flickr. Q. There's so much to be excited about surrounding the Nicholas Ray Centenary Project. Can you tell us what's all in the works? Ahh, there's a lot in the works! The centerpiece for the Centenary Project is the reconstruction/restoration, already completed, of WE CAN'T GO HOME AGAIN, Nick's experimental last film, to premiere in just four weeks at the Venice Film Festival. Accompanying the premiere will be a full-length documentary, DON'T EXPECT TOO MUCH, about the making of Nick's last film (more on both films below). Additionally we have a website, in preparation as we speak, that will replace our provisional website at www.nicholasrayfoundation.org. The new site eventually will offer a comprehensive array of materials, updated regularly, concerning the life, work, and times of Nicholas Ray. The materials will include still photos, audio, film, and video clips, writings by Ray himself, considerations by critics and film historians, and links to other related sites. Also our site will provide a link to a facility that will make materials--both sound and picture—from the Ray Archive available for auditing or viewing and licensing. These materials include historic elements Ray gathered at and around the Chicago Conspiracy Trial. We will also offer another film, tentatively titled NICHOLAS RAY MASTER CLASS and intended as a teaching tool, on which editing will begin in the next two months. It will include archival audio recordings of Ray teaching film craft and discussing his own films and the films of others as narration over clips of the films themselves and visual materials from the Ray Archive. Finally, we are exploring several paths towards mounting a museum installation exploring Ray's use of multiple image. A piece of mine on the subject will appear in CINEMA SCOPE in September. Q. It's been said that Ray was never satisfied with WE CAN'T GO HOME AGAIN. What was restored in this new edition? Did you uncover any surprises? It may be more accurate to say that the film was never completed. It was, and remains, an experimental film from a number of perspectives, as well as a film without stars, so work on it it has always been extremely difficult to finance. Nick had hoped to be able to return to it and bring it to full realization, but the chance didn't come in his lifetime. The reconstruction/restoration of WCGHA, overseen by our wonderful colleagues at the EYE Institute Netherlands and the Academy Film Archive, and supported by the Venice Film Festival, RAI, Gucci, Martin Scorsese's Film Foundation, The Gulbenkian Foundation, La Cinematheque Francaise, and the Museo Internazionale del Cinema, was undertaken with the intention of respecting and preserving the film's "homemade" and spontaneous qualities, while undoing some of the negative effects of time on its elements. As the film's imagery finds its place at the interface between fine art and cinema, we chose not to re-edit or reconstitute a single frame of the picture. We did, however, digitally clean the picture to remove obscuring dust and dirt and certain other distracting technical problems that arose during the hasty preparation of the film for screening at the Cannes Festival in 1973. The work on the soundtrack included a similar kind of cleanup. Additionally we returned to the original 1/4-inch sound recordings to fill in, wherever possible, missing or degraded sound and to replace the narration that was heard in 1973 at Cannes with one in Nick's own voice that he never got the chance to insert. We feel this "reconstruction" of the soundtrack, though not major, does make the film significantly more accessible. Q. Does your documentary DON'T EXPECT TOO MUCH show us a different side of Nick? You will have to tell me! It's my hope that this full-length documentary will contribute to an understanding of what Nick was trying to accomplish with WCGHA. Nick used to say—and it's been my direct experience as well—that few people know how to view a finished film and anticipate what it could become. It seems that many, viewing the rough and messy nature of WCGHA, assumed that Nick had somehow lost his discernment as a filmmaker. I believe that DON'T EXPECT TOO MUCH will make clear that this was not the case. Nick had very clear intentions for WCGHA, for both the film's form and its content, and he expresses these pretty articulately in DETM. And consistent with the entirety of his filmmaking career, these intentions related to a vision of cinema and an understanding of what was unfolding in our world that was a good 40-50 years ahead of its time. That the film did not reach completion, and that the experiment was not entirely "successful" even in the filmmaker's own assessment, does not in any way diminish the clarity or worth of the original intentions behind it. It seems that in the achievement of anything truly new and groundbreaking, failed experiments usually precede—and are essential to—its success. In WCGHA we have the opportunity to see unfold a bold and prophetic experiment helmed by a master in his field. Although it's asking a lot of a little documentary, I also hope DETM will support WCGHA in opening the door to the consideration of some issues underlying Nick's film, issues that seem even more meaningful today than they did 40 years ago when WCGHA was shot. These issues include the obsession with self-image, the addiction to perfection (and the dynamic of addiction in general), the emphasis on product rather than process, the invisible power structure over us all and the resulting lack of accountability among those holding the power—and the list goes on. Q. How would you describe Ray's approach to filmmaking? I'm probably not the best person to ask that. I may, however, be able to say something about what seems to have been most important to Nick. He saw filmmaking as a way of life, what some would call a practice, even a spiritual practice, which is to say, for Nick it was a way to investigate, process, and communicate his experience of himself and his world. Even more than a filmmaker, Nick was a seeker, a man with a powerful drive to understand himself and his fellow humans. To my mind it was an aspect of his integrity as a seeker that he didn't hide or disguise any aspect of himself, including the less attractive ones. He believed that "an artist must expose himself," to use his words. To me this was a generous and brave way of living, although not an easy one, certainly not for him and sometimes not for those around him; but personally I prefer it to the surgically altered, styled, air-brushed, or public-relations-firm-manufactured versions we're offered of public figures nowadays. And as often evolves in those who seek long enough, he also had a profound and active concern, as corny as it sounds, for the well-being of all life on Earth, for us all learning to "say hello to each other." There's a great fascination with his flaws and failures, while it seems that this pretty essential aspect of his nature is too often overlooked. Q. How often did Ray return to his hometown in Wisconsin? To what extent did his roots play a part in his identity? Nick returned to LaCrosse, Wisconsin, where he was raised, two or three times in the 10 years I knew him. It seems one's roots (or the lack thereof) necessarily play a significant part in anyone's identity, as they certainly did for Nick. He had a strong feeling for this country's indigenous people, its land, its wildlife, its folk ways. Even had I not known him at all, his films make that pretty clear. Q. Our staff has been curious about rumors that a biopic about Ray is in the works, and being developed by Philip Kaufman. Can you tell us anything about this? Yes, there is a film in development, to be directed by Philip Kaufman and produced by Lightstream Pictures, based on my memoir of Nick in I WAS INTERRUPTED. The script was written by Phil and his son Peter in collaboration with Academy Award nominee Oren Moverman, and it seems they have one of our very greatest actors lined up to play Nick. I believe they're scheduled to start shooting before spring. Please check the Foundation website for further updates, coming soon! Susan Ray is set to present WE CAN'T GO HOME AGAIN alongside James Franco on Sept. 4th, 2011, at the Venice Film Festival. This fall, UMP proudly brought back into print Nicholas Ray: An American Journey, by Bernard Eisenschitz, translated by Tom Milne.